It is applied as the hinged equipment for excavators performs works on dredging from depth, to digging on big depths, loading to unloading of bulks, crushed stone and so forth. 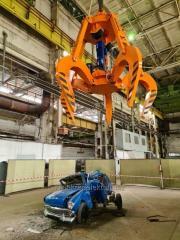 The grab can be equipped with the rotator that allows to turn working body on 360 °. It considerably increases productivity and allows to work in any conditions. The reliable design of the grab, the best technological parameters allows to make loading of any bulks and several times to increase labor productivity. Unbelievable price on The grab digging with the rotator in Zaporozhe (Ukraine) company Zavod Krankomplekt, OOO (Kranovyj Zavod).